Overview of the May 5th engagements by Benson Lossing. There are a few inaccuracies since he was visiting the site in the 1860s, namely the bridge. This is the second post of a series on the First Siege of Fort Meigs, which took place 198 years ago this week. 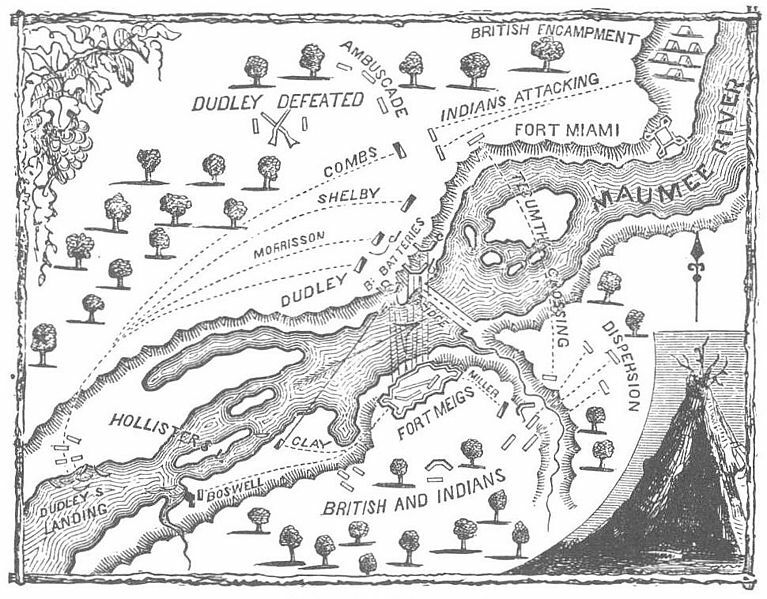 When Col. Dudley attacked the batteries of the enemy, opposite Fort Meigs, on the 5th of May, 1813, he advanced in three columns. The right, led by himself, carried them without the loss of a man. The middle was the reserve. The left, headed by Major Shelby, formed at right angles on the river, to protect from below. This arrangement was scarcely made before the spies under my command (about thirty in number, including seven friendly Indians), who flanked at some hundred yards distance in the woods, were attacked by part of the Indian force of the enemy. 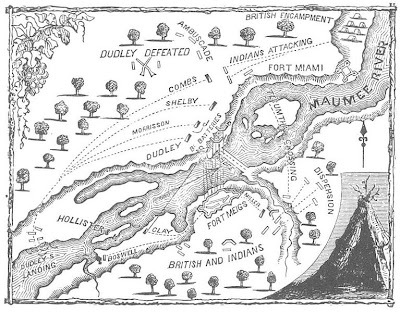 Unacquainted with the views of Col. Dudley, they knew nought but that it was their duty to fight. For near fifteen minutes, with the loss of several killed and wounded, they maintained an unequal conflict. In this time, Col. Dudley having effected his object, and fearing their fate, had advanced to their relief with the right column. The enemy retreated. Our troops, impelled more by incautious valour and a desire for military distinguishment than prudence, pursued. He then stood firm for a short time on his right, and gave way on his left, which threw our line with its back towards the river, so that every step we advanced carried us farther from under the protection of our fort. Whenever we halted, so did the Indians, and renewed their fire—we charged on them. They again retreated. In this way, with the loss of from thirty to fifty killed on our side, and a number wounded, was the battle fought for upwards of three hours. How much the enemy suffered during this time, 'twas impossible to ascertain from the circumstance of their bearing off their dead. Maumee River, north bank, looking downstream towards Fort Meigs. It was near here that Dudley's men landed their boats. At length orders were passed along the line directing us to fall back and keep up a retreating fire. As soon as this movement was made, the Indians were greatly encouraged, and advanced upon us with the most horrid yells. Once or twice the officers succeeded in producing a temporary halt and a fire on the Indians, but the soldiers of the different companies soon became mixed—confusion ensued— and a general rout took place. The retreating army made its way towards the batteries, where I supposed we should be able to form and repel the pursuing Indians. They were now so close in the rear as to frequently shoot down those who were before me. About this time I received a ball in my back which yet remains in my body. It struck me with a stunning, deadening force, and I fell on my hands and knees. I rose and threw my waistcoat open to see whether it had passed through me; finding it had not, I ran on, and had not proceeded more than a hundred or two yards before I was made a prisoner. In emerging from the woods into an open piece of ground near the battery we had taken, and before I knew what had happened, a soldier seized my sword and said to me, "Sir, you are my prisoner!" I looked before me and saw, with astonishment, the ground covered with muskets. The soldier, observing my astonishment, said, "Your army has surrendered," and received my sword. He ordered me to go forward and join the prisoners. I did so. The first man I met whom I recognized was Daniel Smith, of our company. With eyes full of tears he exclaimed, "Good Lord, lieutenant, what does all this mean?" I told him we were prisoners of war. . . .